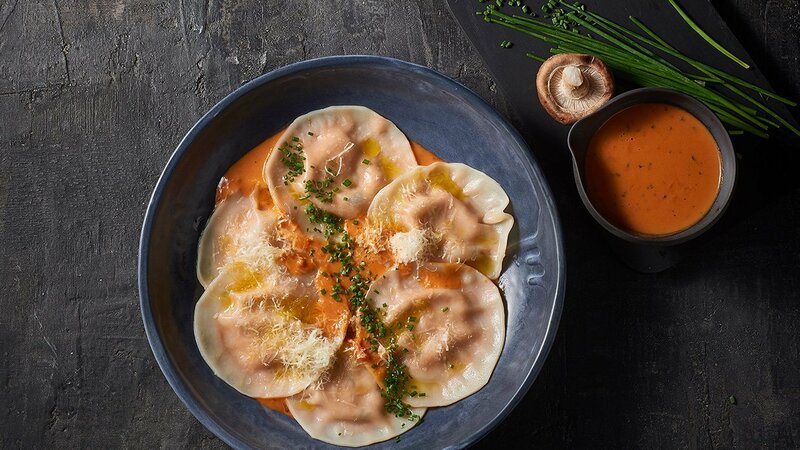 Hand-crafted chicken ravioli pillows. Made with wonton papers and served with a tomato cheese sauce. Entrée or main, this dish is one to try. To make filling - sauté chicken and onions. Once coloured add Mushrooms and seasoning, continuing to sauté until cooked. Remove from heat and set aside to cool. Take the egg and make an egg wash.
Take two wonton wrappers and place a teaspoon of mix in the centre of one wrapper. Brush around the mix with egg wash and then place the second wrapper on top. Using your fingertips press around the mix making a pillow. Using a sharp knife trim excess wrapper and then squeeze around edges to ensure a tight seal (repeat this to make 60 individual ravioli). In a saucepan bring ingredients to boil. Reduce to a simmer and allow to reduce a little - serve. Sprinkle with chives and fresh grated parmesan cheese.